The ship’s galley was where the cooks prepared the food for the ship’s crew of 330 men. 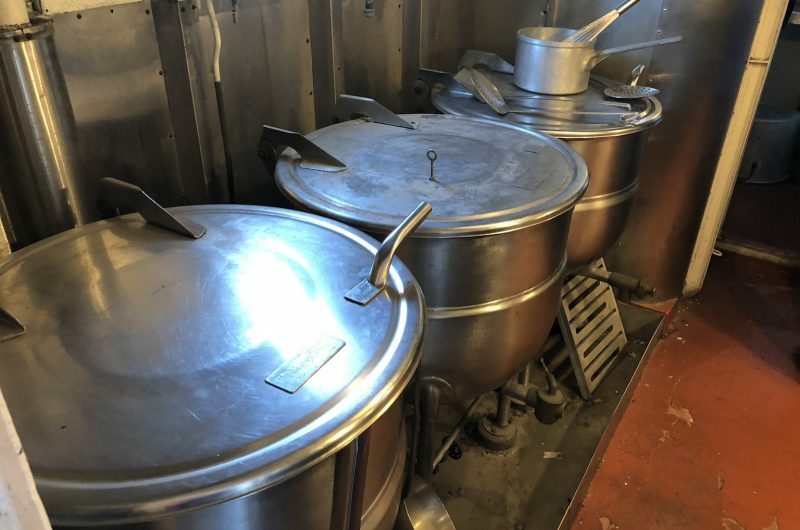 Soups and stews were boiled in the three large steam kettles. 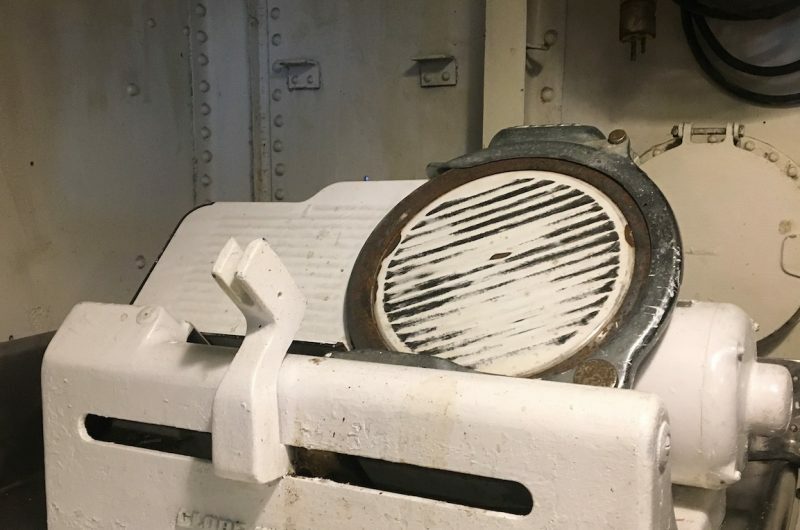 Two grills and a fry kettle were located against the forward bulkhead. 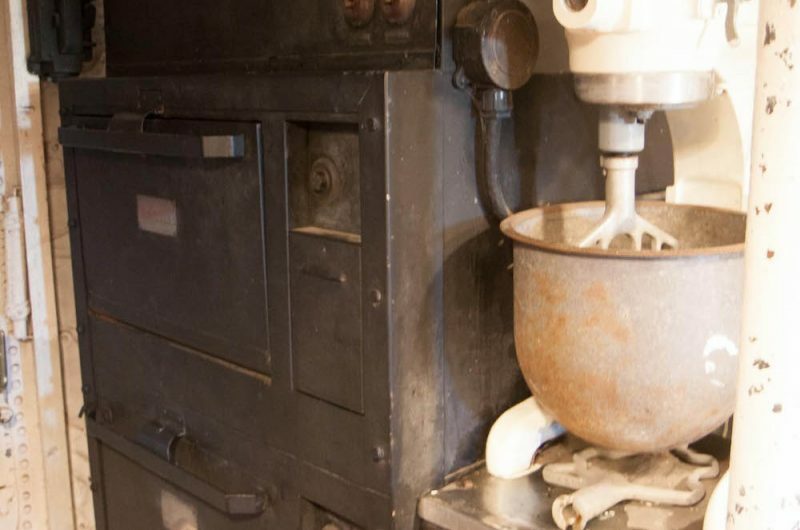 Three ovens provided a constant flow of fresh baked bread. The galley was a popular place late at night when the fresh loaves came out of the oven. 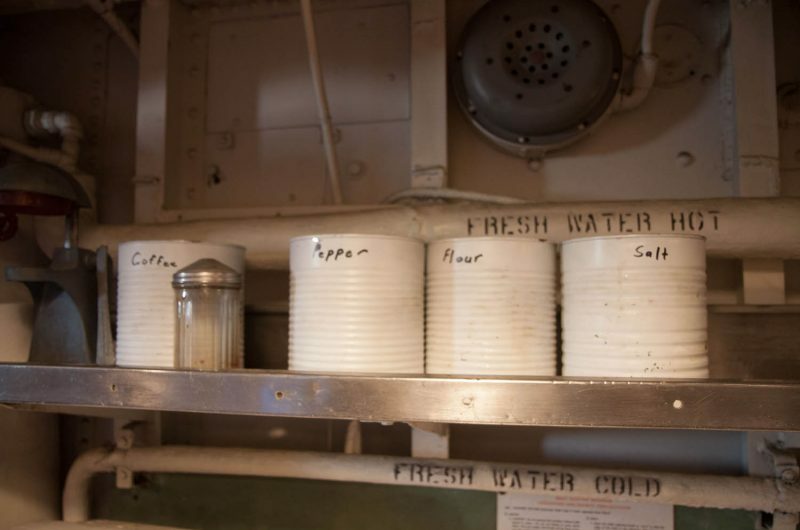 The galley was also a dangerous place when high seas and heavy rolling would cause hot broth to slosh from the cauldrons, or pitch the novice cook against a hot grill top. Food stuffs were stored in the reefer spaces(refrigerators) below the Messdeck. 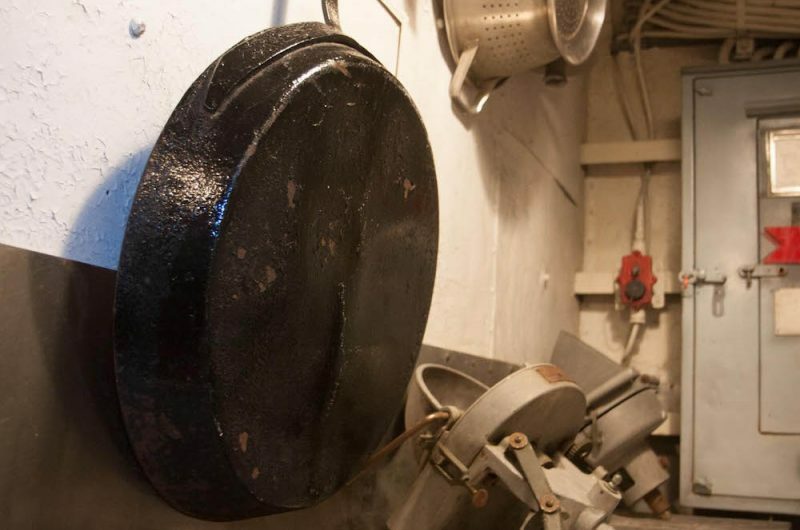 At mealtime, heavy pans of food were carried forward and down two decks to the messdeck. 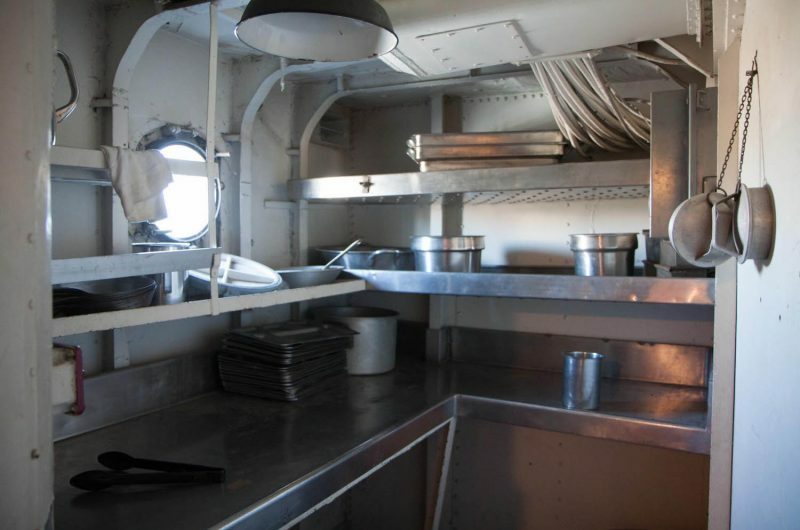 The galley was capable of keeping the crew well fed as long as supplies held out and seas were moderate. 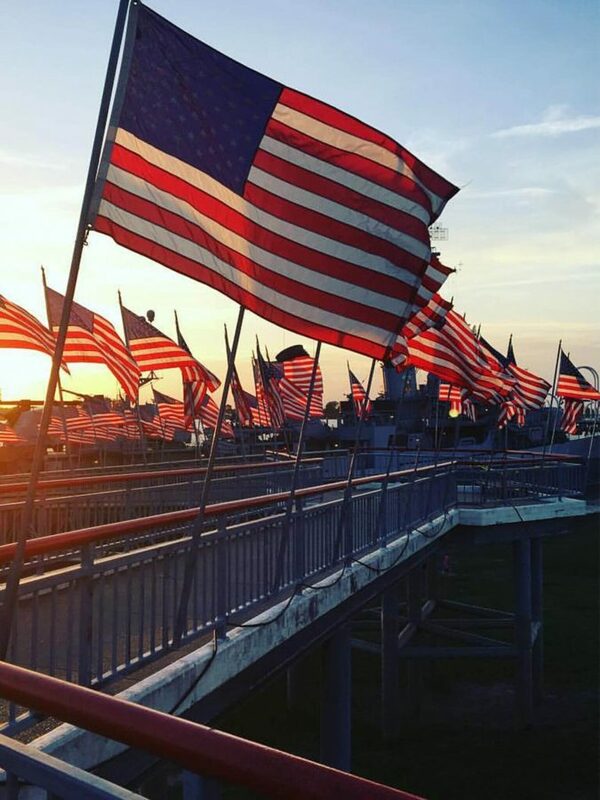 However, many a destroyerman will recall subsisting on coffee and sandwiches during prolonged periods at battle stations or stormy weather. 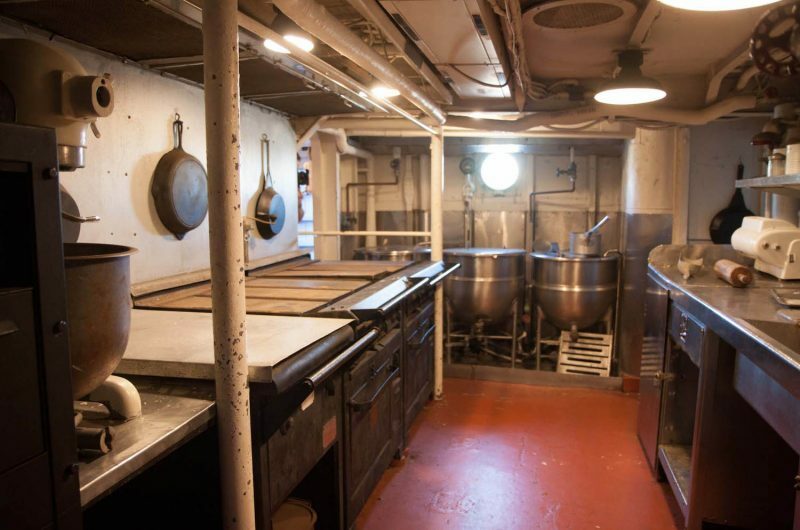 Notice that the deck is painted red here inside the galley. 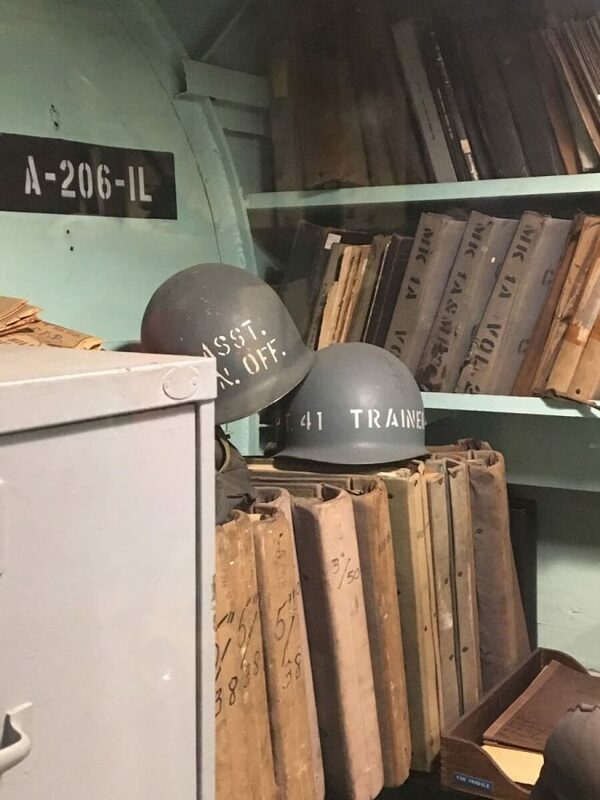 The space doubled as an emergency first aid station during battle. The red paint serves to camouflage any blood loss to patients to help prevent them from going into shock. 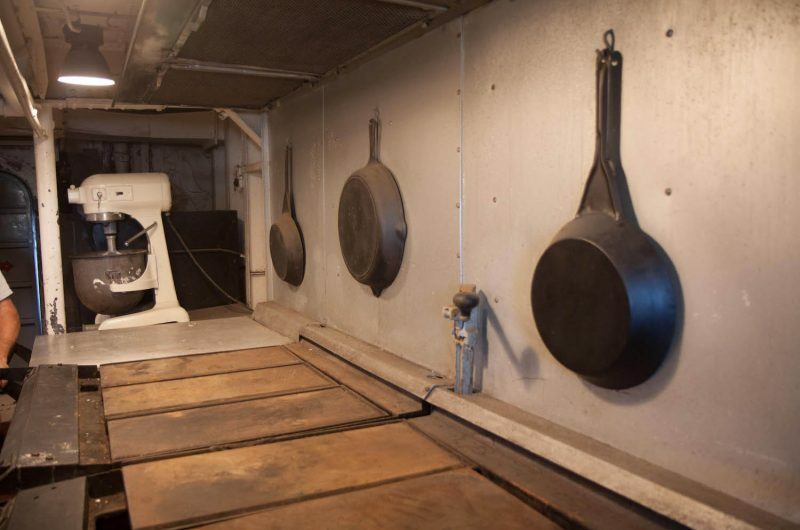 The vegetable preparation space contained the ship’s potato peeler, a device that robbed sailors of one of their traditional duties. The automatic peeler was also known as the “marble maker” because of the size of the resulting vegetable if left in for too long. 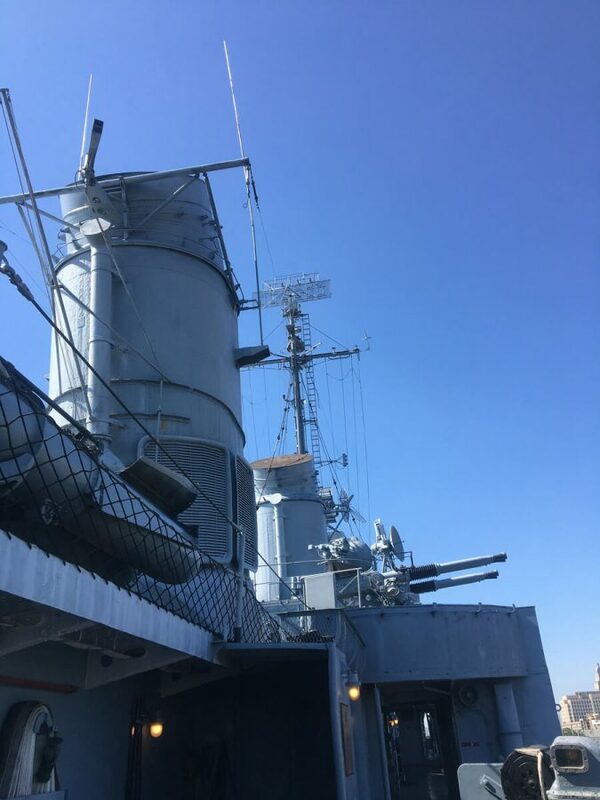 The sound-powered telephone gave the cooks contact with the food handlers down in the food service line two decks below. 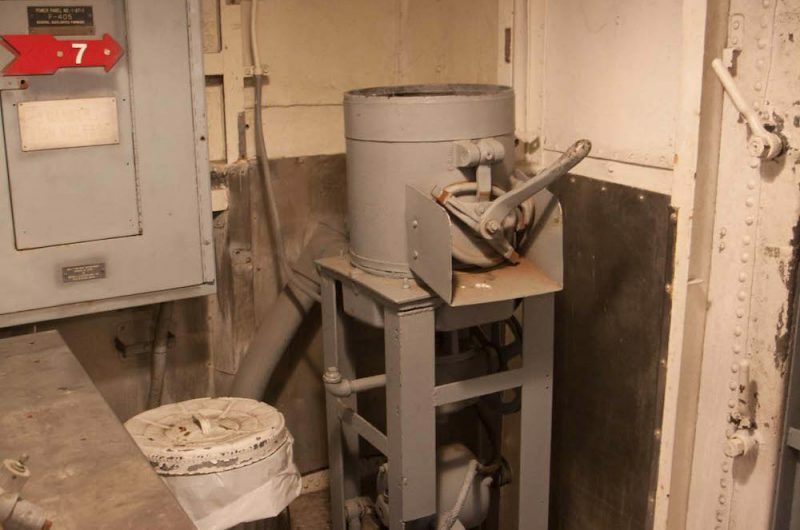 This enabled cooks to keep the chow line from running out of food. You’ll see these phones scattered throughout the ship. They were a primary internal communication system. You’ll notice switches along the tops of hatches throughout the ship. These were part of the darken ship system. These switches caused all the lights in a compartment to go out when an outside door was opened to keep the ship from being spotted at night. 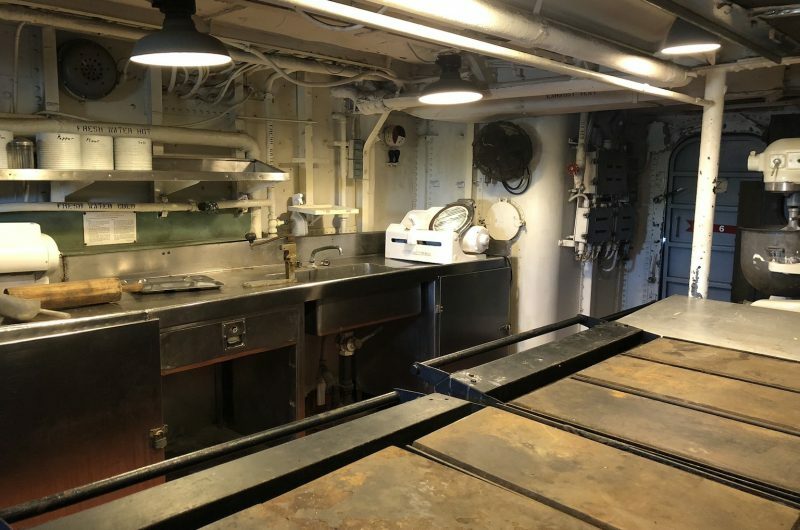 All weather deck doors and hatches (i.e. 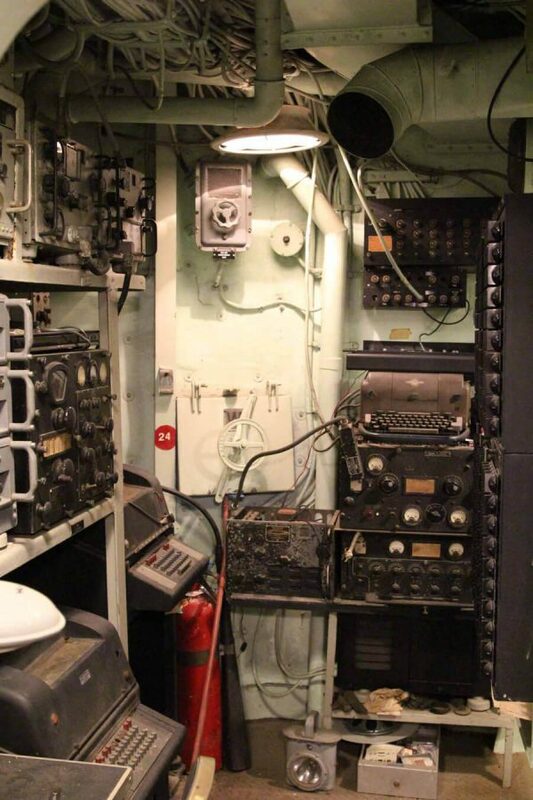 opening onto the exterior of the ship) were equipped with these switches. 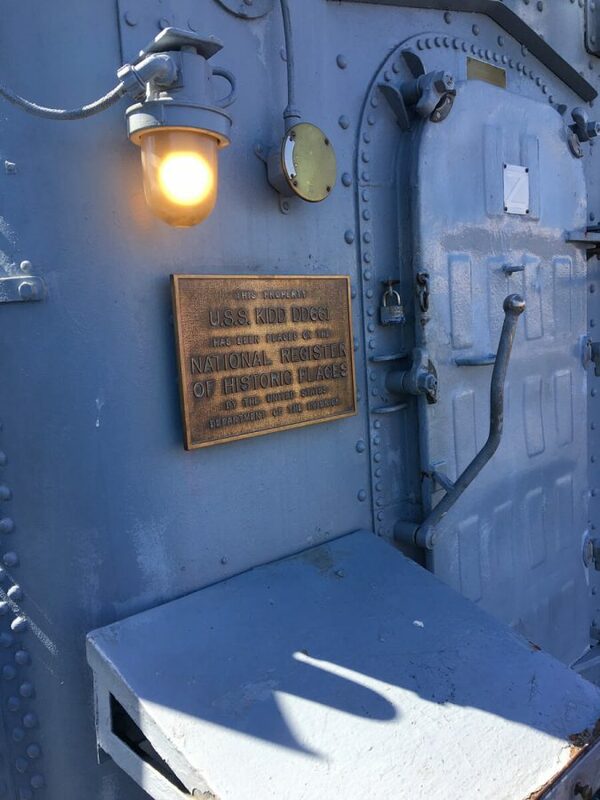 After 2200 hours (10:00 p.m.), crew’s quarters and passageways were lighted by red lamps to protect the night vision of the crew. White light was also easier to see at a distance than red light.